A Kiwi classic meal, fish and chips is a quick and easy meal after a hard day in the sun…this weekend was the first time that I have used a beer batter but it certainly won’t be the last!!! The batter is simple, just an egg, about half a cup of flour (self-raising or toss in 3/4 teaspoon of baking powder), and enough beer (Tui Golden Lager worked well) so that the batter is runny enough for the fish to be dunked in it. Let this sit in the fridge for 30-60 minutes – the Masterchef recipe said 30 but I got distracted and left it for 60 and it was still good and still good again for Sunday’s dinner as well. 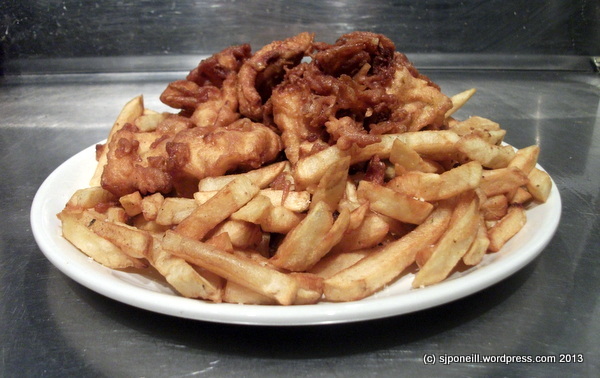 While the fish is soaking up the beer flavour from the batter, start on the chips. I always suffer from The Legend of the Little Boy Whose Eyes Were Bigger Than His Puku when I make chips and make more than I need (but rarely more than I can eat!!). I usually use our custom chip cutter but I am thinking that next time I might cut them myself so that they are bigger and chunkier. Once chopped, give them four minutes in the microwave. This pretty much cooks them and means that the frying is mainly applying a crispy surface. By now, your oil should be hot enough so you can transfer the chips directly into the oil from the microwave. I use a slotted spoon to do this to minimise splashes – trust me, that oil is HOT!! Keep the chips in the oil for four minutes then take them out and drain them. Turn the fryer up to its hottest setting and once it is hot hot hot, place the chips back into the oil…leave them in the oil until they attain your personally preferred shade of golden brown. Remove and drain. Add the battered fish to the oil and cook them for two to three minutes – this is all they need to cook all the way through. While they are cooking, plate the chips and, as soon as the fish are done, drain them and plate them as well. Sprinkle some sea salt over the top, squeeze some lemon on to the fish and voila, done!! 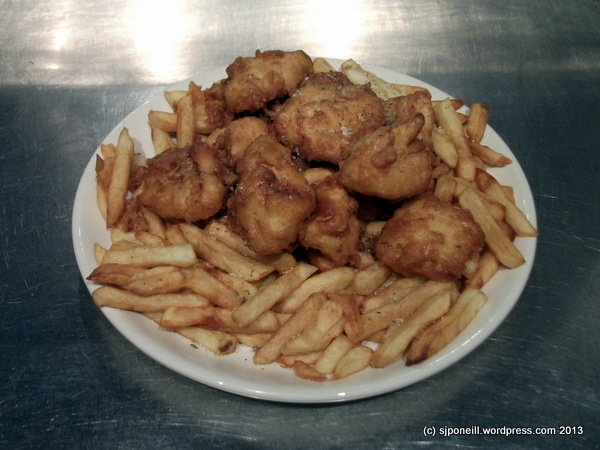 This entry was posted in Masterchef Raurimu and tagged fish and chips by SJPONeill. Bookmark the permalink. Yeah you’re right, because if not its just an oily mess..